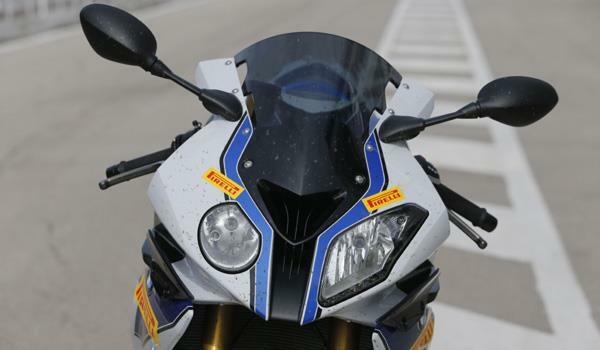 It’s the first sports bike to be produced with semi-active suspension. The damping inside the HP4’s Sachs forks and rear shock adjusts as you ride, based on your road speed, throttle position, lean angle, shock movement and intervention from the traction control and ABS.Preload is still manually adjustable. The suspension’s parameters are set within each of the four riding modes – softest in Rain mode and hardest in Slick. A similar system is used in the latest Ducati Multistrada S, but it’s tailored towards comfort, not performance, like the HP4. The Ducati and MV have electronic Ohlins, linked to the riding modes, but the suspension settings stay static as you ride. Even higher spec than the S1000RR, the HP4 also boasts Brembo monobloc front brake calipers, 15-way adjustable traction control, which you can change on the move, lightweight wheels, smoother fuelling and more mid-range. The biggest surprise is how much it actually weighs. Measured on a calibrated set of scales, fully-fuelled, at Pirelli’s testing HQ in Sicily it’s a not insignificant 210kg – 18kg more than the 1199R. The extra weight actually makes the HP4 feel friendlier, more cossetting and stable than the Ducati and thanks to the Beemer’s turbine of an engine, it’s still flippin’ fast and puts a huge smile on your face. We’ve tested the HP4 a number of times on road and track and were sure it would be dominant here at a rough and bumpy Pergusa circuit. The BMW’s clever semi-active electronic suspension shines on inconsistent surfaces like this. Ever-changing to suit the speed, lean angle and track surface, the rear suspension lets the rear Pirelli Super Corsa SC2 create immense grip. Hodgson’s 1.47.7 lap time is faster than he went on an S1000RR last year (1.49.7) and a fraction faster than Pirelli’s racing tyre test rider (1.47.9). But to colour those figures, the track has been resurfaced in places and we’re now using Pirelli’s new, second-generation Super Corsas. 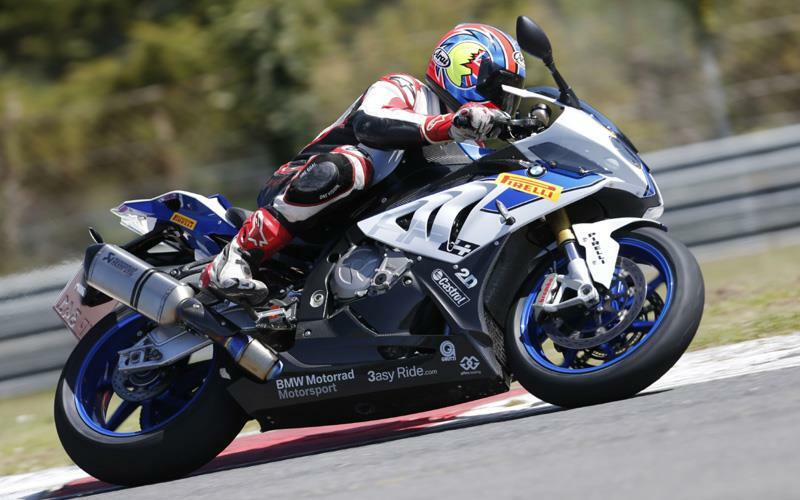 We’re convinced the HP4 could’ve gone faster still if we’d made it firmer and quicker-steering. We added a couple of clicks of rebound and compression damping front and rear (which is done on the HP4’s dash menu), which helped, as did switching to the raciest of the riding modes: Slick. But the HP4 sits flat and is slow steering out of the crate. It’s perfect for the road, but you need more agility for the track. With the back of the bike relatively low, we struggled to get the BMW turned for some chicanes and it tank-slapped slightly exiting some of the slower corners. You can alter the rear ride height by 10mm on the standard S1000RR by flipping the top shock mount spacer around - it turns it from a great bike into a pin-sharp, fast-steering track tool, but the option isn’t there on the HP4. Its spacer is set in a middle position, so you can’t flip it around to ‘jack it up’. The HP4 actually comes with these ride height spacers separately in a box, along with the chip that lets you activate the HP4’s Slick riding mode. Unfortunately, they didn’t come with our test bike, so we couldn’t experiment with making the rear end higher. 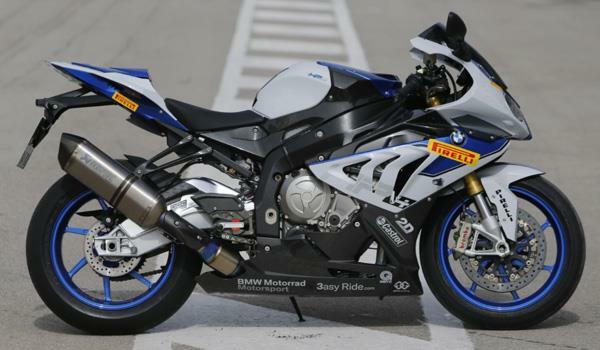 If we could, we’re sure the HP4 would’ve been faster and been able to challenge the Ducati. The HP4 is by far the nicest bike here. It’s the smoothest and encourages you to go fast because it’s so stable on the power. The traction control is very smooth – I only knew it was working because of the yellow TC light flashing on the dash. That engine is so powerful it pulls and pulls and pulls. I didn’t know how the electronic suspension would feel. I expected that when you hit the brakes hard, that the front would stiffen-up, which is how it feels. Overall the bike feels a bit soft, but the suspension was way plusher over the bumps than the other superbikes here and the stability was excellent. The riding position is perfect, but it could do with a higher screen. The brakes fade a bit to begin with and I had to adjust the lever, but they were strong and consistent after that. Suspension: Semi-active set within slick mode. +2 rebound and compression damping at rear and +2 combined damping at front. Shock ride height set in middle position.